It’s my fantasy and it’s yours: Quit the job, say good-bye to the family, and bird. Just bird. It’s what I dream of every Monday morning. British birder Chris Gooddie, my new birding hero, not only dreamed the fantasy, he lived it. And, to give his dream year a little more oomph, he created a grand once-in-a-lifetime goal: to track down and see every pitta species in the world in one year. (That’s Pitta, people, not Antpitta, which is what I foolishly first envisioned, having never birded beyond the Americas.) This is what The Jewel Hunter is about, Chris Gooddie’s “mission” to see 32 pitta species in 12 months, trekking to Asia, Africa and Australia, sometimes with comrades, often on his own, usually crawling through jungle floors, drenched by torrential rains, in danger of leopard or snake or fish attack, desperate for a good beer, thirsty for decent tea. This is the birding adventure book supreme. Pittas, I’ve learned, are small, ground-dwelling rainforest birds, intricately patterned in jewel colors. A Gurney’s Pitta is pictured below, a photograph by Chris Gooddie of the bird that was his inspiration. Skulking masters of camouflage despite their bright colors, they challenge every birding technique. They may respond to a recording of their call once, show themselves for a few seconds, and not respond again for the whole day. Gooddie claims that pittas have magic powers: “Despite their typically rather chubby frames, they are able to flatten themselves behind single blades of grass. They can travel through space-time without leaving a ripple in the continuum in a way that even Stephen Hawking could not begin to explain.” Gooddie describes his quest in terms of a contest of wills and strategy. One must “out-think” the bird. Each chapter of The Jewel Hunter reads like a mini-travel novel. Thankfully, stories of plane travel gone wrong are minimized. There is a lot more to tell: descriptions of remote villages, delicous exotic food, unusual exotic food, going hungry, preparations for treks into isolated jungle areas (does one buy Quaker Oats or a live chicken? ), how guides and drivers are found and where they live and what their families and homes look like, birder friends who accompany him on some legs of his quest, and the quirky people he ends up sharing beers with, in bars in huts on stilts. Beer looms large in Gooddie’s daily routine, and much text is devoted to finding beer in the middle of rural Asia and evaluating its quality. If you want to travel the world birding and drinking beer, The Jewel Hunter is a must-buy. Goodie writes beautifully about his pittas once he finds them. Here is a little bit of his depiction of the male Banded Pitta: “Broad stripes, crisply delineated above and below in black sweep back above the eyes. Primrose yellow at first, they deepen to a burnished orange that lights up the forest.” Once he finds and photographs (if he can) the target pitta, he pauses to savor his success and then proceeds to bird the hell out of the island or park or mountain, finding endemics and specialties, birds I’ve never heard of with names like Philipine Frogmouth, Malaysian Rail-Babblier, Rusty Laughingthrush, Great Argus. Some of his finds are the first documented records of the bird in that area or the first decent photograph of a little-known species. If it were just the birds, I’d grab my bins and be on the next plane to Asia or Africa . But, there are other things out there in the jungle, things like leeches. And mosquitos. And leeches. And pit vipers. And sun bears. And leeches. And getting lost without a GPS. It’s tough birding the rainforest on your own. The Jewel Hunter belongs to a singular niche, the Big Year/Big Lifelist book. I enjoy these books tremendously, and I know other birders, some blogging here, who gobble them up. When I was starting to bird, Kenn Kaufman’s Kingbird Highway and Mark Obmascik’s The Big Year taught me the importance of strategic thinking and patience and being part of the birding community. Now that I’m a little further down the birding road, Big Year books are my “good read” of choice. The books work best when the birding is coupled with the human element. Kingbird Highway is a great read because it is also a classic story of a young man growing up. On the other hand, Phoebe Snetsinger’s memoir, Birding on Borrowed Time, becomes tedious because of her lack of emotional disclosure. The Jewel Hunter can be frustrating in this respect. Gooddie’s yearning to see his pittas, so well described in the first chapter, often gets lost in the details of his travels. What are the consequences of birding almost non-stop for a year? There is a paragraph near the end where you get a clue; Gooddie mentions, almost off-handedly, that he has spent most of the past year alone, not talking or interacting with people. That comment jumped out at me with an almost electric shock. The chapter on Sri Lanka, where Gooddie combines a vacation with his girlfriend, largely invisible elsewhere in the book, with his search for Indian Pitta, is to my taste one of the best parts of the book. 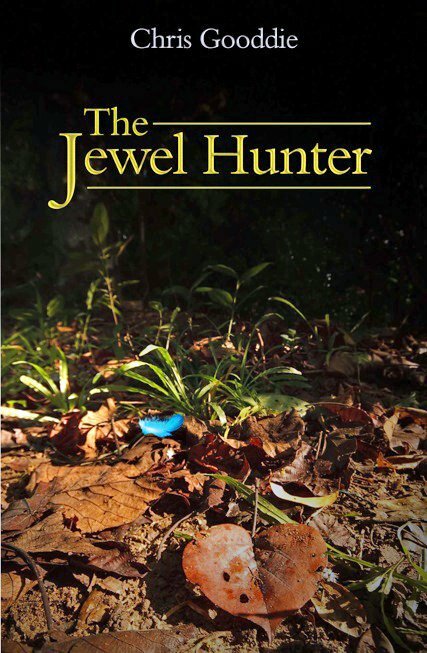 The Jewel Hunter is heavily laced with Gooddie’s particular brand of broad ironic humor, and I did enjoy that, but I would have traded about 10 percent for a little more insight into the unexpected outcomes of his experience. Overall, I think 10,000 Birds readers would reading enjoy The Jewel Hunter. 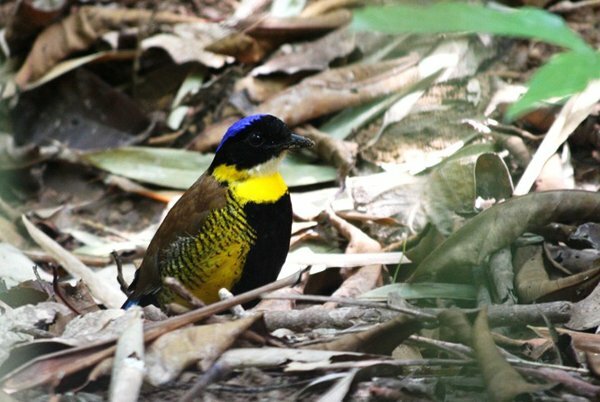 There is a surprising amount of suspense incorporated in the tale, reaching its apex when Gooddie flies to Sabah, East Malaysia with three old friends to find the “mythical” Giant Pitta. His humor is wicked funny, especially when pointed at birding itself. There is little factual material here about global conservation and protection, but that is not the book’s purpose. This is a travel adventure book. The urgency of preserving habitat is however ingrained in every chapter. The Jewel Hunter is illustrated with 19 black-and-white maps, each showing the route and target pitta. There are five photographic inserts, over 100 pictures of some of the more notable birds and of traveling companions and guides. The photos I looked at the most, over and over, were those in a section entitled “The Treasure Chest”, the photographs taken in the field of all the pittas seen (that could be photographed) in the order seen. “All photos were taken by the author and were the best I could obtain under trying conditions,” Gooddie writes. This is true. Some are fairly good, some blurry and dark. I was hoping for better visual evidence that these birds are “the most beautiful genus of birds in the known universe” and eventually found Pittas World. This is Gooddie’s web site, the host of his original travel blogs and a platform for pitta photographs, video, and paintings by fortunate birders and talented artists. 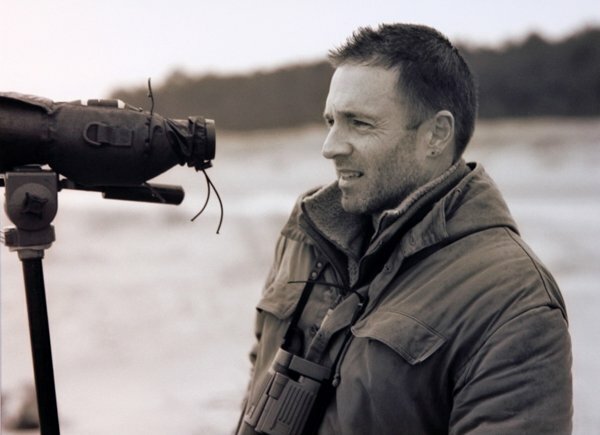 The Jewel Hunter is published by WildGuides, a UK publishing company that specializes in photographic field guides, and which donates a percentage of profits from each book to a conservation organization, in this case, Birdlife International. You can buy the book fairly easily through online booksellers; look up the title in Amazon.com or Abebooks.com. The Book Depository, a British online bookseller that uses the Abebooks.com portal, charges $22.54, including shipping. And, good news! As I was finishing up this review, I discovered that Princeton University Press will be bringing out a U.S. edition of the book in the fall. (At the current time, information on pricing is not available.) There go my plans for a 10,000 Birds write-in campaign. Pittas, a bird species I never heard of before reading this book, are cropping up more and more in the online birding world. Dale Forbes wrote that there are Only 5 pairs Gurney’s Pitta left in Thailand last June. His video of the most adorable blue-tail-wagging Gurney’s Pitta ever almost distracts the reader from the serious problem of habitat loss from logging. And, just last week James Currie posted about Finding Rainbow Pittas here, on 10,000 Birds, with great video footage. 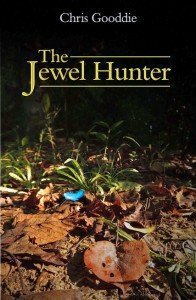 Hopefully, the publication of The Jewel Hunter in the United States will spur additional attention to this family and the need for rain forest preservation and ornithological study. Meanwhile, don’t go birding in the rainforest alone. Let me know what your favorite Big Year book is. And where and how you will be doing your own special birding quest. by Chris Goodie (text and pictures). Forthcoming U.S. publication by Princeton Univ. Press, Fall 2012. All photographs used in this article are courtesy of Chris Gooddie. Aaahhh, Pittas….a worthy compliment to my obsession with warblers. Thank you for a great review, it certainly entices me to read it. Pitties and beer. Isn’t that a Frank Zappa Song? Sounds like a good read, i’ll look for it. @Mama Zen: Yes! These are journeys most of us will only get to do by reading about them. @Jean L.: We are fortunate that we have our colorful New World Warblers. That may be an idea for a different kind of big year–see all the warblers in the world in 12 months. @Arie: Some people reviewing this book said it was missing an appendix listing all the birds he saw during the year. I say, we need a list of all the beers. @Jessica: I hope Chris Gooddie will be able to come to the States and do some book signings and presentations. I bet he is a great storyteller. I love this book – well written, funny, engaging – you can almost see the Pittas and feel the leeches! I’ve been to a number of these places, searched for a number of these ssecies, and was transported back to some wonderful memories page after page. The book really captured the essence of Asian forest-birding, including unique encounters with a range of mouth-watering species (Pitta and otherwise). It really deserves a space on any birder’s book-shelf. @ Jessica – Good news, I bet he is very entertaining in person. Let us know when you hear about dates, etc. @ Anthony – I am very jealous that you have been to these places and seen pittas and some of these other incredible birds. I bet you could write your own book! After reading this fascinating book I immediately want to see some Pittas, the book has that effect on you. I found the descriptions of the places visited make me want to follow in his footsteps ( in most places !) and he has a great sense of humour which also comes across in the book; its a must for a birder. Wow, Malcolm, I am jealous. I agree, reading the book does make you want to bird these incredible, foreign places and see Pittas. Almost two years after reading this book, I still think about it. And the Pittas! Although I am definitely not a twiticher I thoroughly enjoyed Chris Goodie’s book The Jewel Hunter. I wrote to the Royal Geographical Society in London to say what an able speaker I thought he was and what a tale he had to tell in this book. Lectures at the society are often given by an author promoting his book which is on sale to members after the lecture. So Chris might like to approach them knowing he has already been recommended.